Vertical-axis wind turbines come in one of two basic types: the Darrieus wind turbine, which looks like an eggbeater, and the Savonius turbine, which uses large scooped cups. Vertical-axis wind turbines were tested and used more extensively in the 1980s and 1990s because they were quieter and could operate without requiring yaw controls, regardless of the wind’s direction. This section will explain the operation of vertical-axis wind turbines and discuss their advantages and disadvantages. The Vertical-Axis Wind Turbine (VAWT) is a wind turbine that has its main rotational axis oriented in the vertical direction. VAWTs were innovative designs that have not proven as effective in general as HAWTs, but they have a few good features, including quiet operation. Because they are not as efficient as HAWTs, they are rarely used in large units. Most VAWTs are smaller units that can be located in residential and commercial locations because they are much quieter than the horizontal-axis turbines. The two types of vertical-axis wind turbines are the Darrieus wind turbine, which turns a shaft using lift forces, and the Savonius wind turbine, whose cups are pushed by direct wind forces. 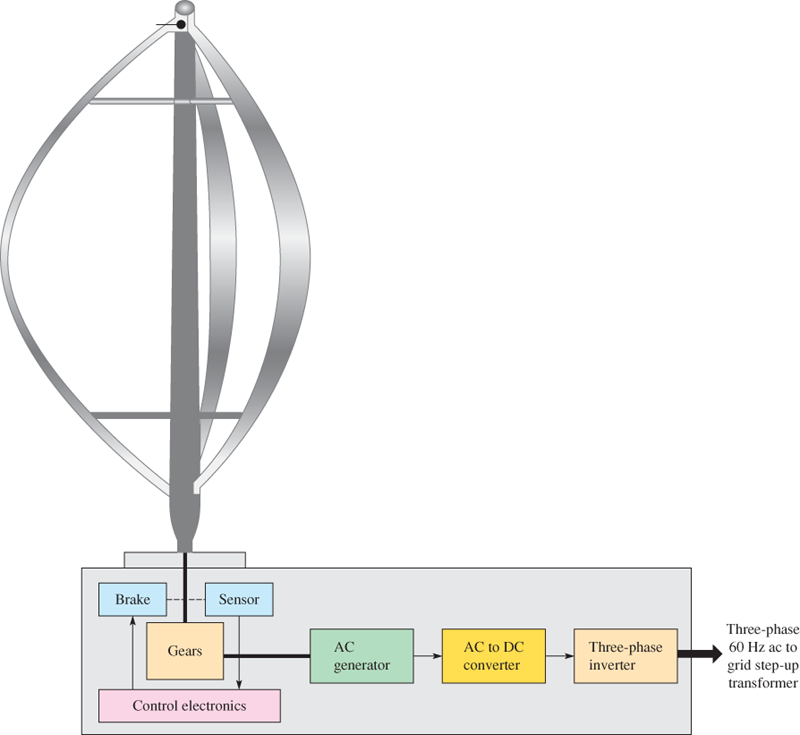 Vertical-axis wind turbines can produce electrical power at lower speeds and at a variety of changing speeds. Because they vary widely in speed, the AC generators they use do not produce a constant output. Usually, the output goes to an inverter that converts it to standard AC (either single-phase or three-phase). Another option is to use DC as the output. Figure 1: Smaller vertical-axis wind turbines operate well in urban environments, where they provide quiet, vibration-free operation. In urban areas, wind speed and directions are frequently changing, and wind speeds tend to be lower because of buildings and other objects that create wind shadows. Vertical-axis wind turbines can generate the voltage at low wind speeds, and they do not have to change direction to catch the usable wind. Figure 2 shows a typical Darrieus vertical-axis wind turbine. The physical appearance of the Darrieus wind turbine looks like a large egg beater. The blade is mounted on a large monopole, and the generator is located at the bottom of the blade. The top of the pole has a number of guy wires that hold the pole in place when the force of the wind causes the blade to rotate. Figure 3 shows the internal parts of the Darrieus wind turbine. When the Darrieus blade is operating, it is moving through the air in a circular path. The oncoming airflow generates a net force pointing obliquely forward and is projected inward past the turbine axis at a certain distance, giving a positive torque to the shaft. This helps the blade to rotate in the direction it is already traveling. The action of this blade is similar to the aerodynamic principles used in helicopters, and it makes the operation of this type of wind turbine quieter than a horizontal-axis wind turbine of the same size. Because there is less friction on the blade, the blade can rotate with equal torque regardless of the wind’s direction. A problem with the Darrieus wind turbine is that it is not self-starting, so it uses its generator as a motor to get the rotor started. As the wind increases the blade speed, the power to the motor is turned off and it begins working as a generator. 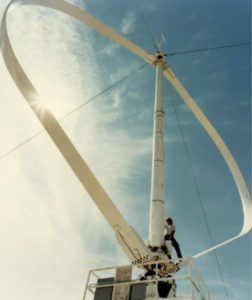 Darrieus wind turbines were installed on early wind farms, but most of them have been taken out of use in commercial applications because they are not as efficient as HAWTs and they require constant maintenance. Figure 4 shows another type of vertical-axis wind turbine called the Quiet revolution QR5. This unit, a variation on the Darrieus wind turbine, quietly produces enough energy to supply a home or small office even at lower or variable wind speeds. The unit requires a three-phase electrical connection, which may not be available at some smaller commercial or residential sites. At the present time, it is used only in the United Kingdom. The rotor is approximately 5 m (16.4 ft) tall and 3.1 m (10.17 ft) in diameter, and it weighs approximately 450 kg (990 lb). The blades are on a 3.4-m (11.15-ft) shaft where height restrictions are a concern; the blades are on a larger one when permitted. The QR5 turbine uses a direct-drive, permanent magnet synchronous generator integrated into the base of the rotor. The peak power with wind speeds of 14 m/s is 7.4 kW and 6.2 kW DC. The British Wind Energy Association (BWEA) rated power is 8.5 kW aerodynamic power, which is rated at a wind speed of 16 m/s. After converting to electrical power, the output is 7.0 kW DC or 6.5 kW grid-quality AC. The QR5 turbine can provide between 5,000 and 11,000 kWh per year, depending on the amount of wind at the site. The aerodynamic helical blade results in a very smooth, nearly silent operation. The Savonius vertical-axis wind turbine uses cups, called scoops, instead of blades to capture wind power. Figure 5 shows an example of a Savonius vertical-axis wind turbine. When the wind blows, it creates a positive force in the scoop and a negative force on the back side of the scoop. This difference in force pushes the turbine around. 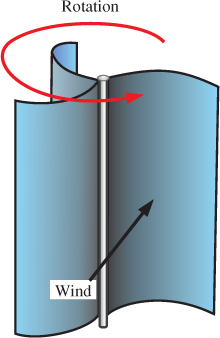 In a typical Savonius turbine, the wind comes from the front of the cylinder, causing rotation. However, wind also strikes the back of the other scoops, tending to slow the rotor. Table 1 lists the advantages and disadvantages of vertical-axis wind turbines. Slower blade speeds because the blades are closer to the axis of rotation. Vertical-axis towers are much shorter than horizontal-axis wind turbines. The generator is generally mounted closer to the ground, so a crane is not needed for servicing. What are the two types of vertical-axis wind turbines? Explain how a Darrieus wind turbine is different from a Savonius wind turbine. 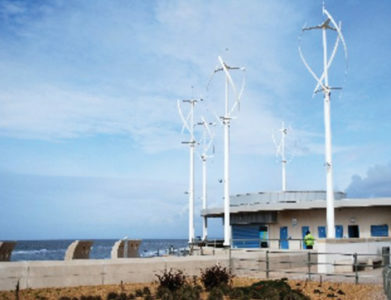 Why are vertical-axis wind turbines used in cities more often than are horizontal-axis wind turbines? The Darrieus turns a shaft using lift forces; the Savonius is pushed by direct wind forces.